Mojos (pronounced "MO-hos") originated in the Canary Islands and are sauces made with vinegar, garlic, and oil. They are served cold as an accompaniment to potatoes, meat, and fish. There are generally two versions: mojo rojo (red sauce) and mojo verde (green sauce), and they can sometimes be spicy. However, this recipe is not spicy at all. Cilantro gives this mojo an intense flavor and deep green color, but it does not add any heat. Make this mojo ahead of time, store in a tightly-sealed container and refrigerate to have on hand to serve as a sauce with lunch or dinner. If you don't care for cilantro or have plenty of parsley in your refrigerator or garden, you can substitute a bunch of Italian (flat leaf) parsley for the cilantro. It will have the same bright green color but will impart a very different flavor. 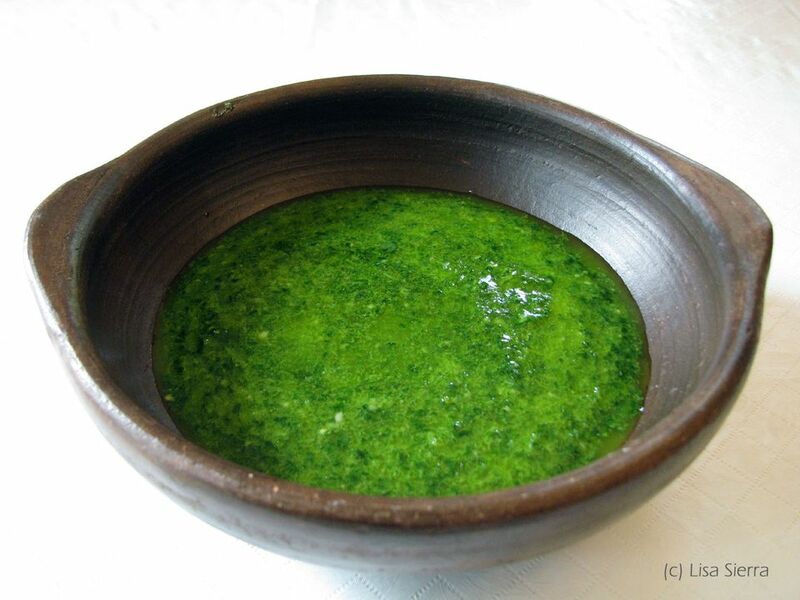 Process the garlic and cilantro with the cumin and salt in a food processor or blender to create a paste. While the processor or blender is running, drizzle in olive oil gradually. Add small amounts of water until the sauce is thick, but not as thick as a paste. Add 1 to 2 teaspoons of vinegar or more, according to your taste. Store in a glass jar (such as the jars made for canning) if you will not use the sauce the same day. Seal tightly and refrigerate.